I thought these images were about the typology of war, before I read the background. They feel like stereotypes, made to inform a contemporary audience about wartime, with the agenda of a museum or war charity behind them. Perhaps educational, perhaps amiss. Then I read about this surreal recreation of war that happens every year and I began to wonder what this work was really about. They have a visual pull which I don’t normally equate with reality. Jim Naughten refers to this series as documentary portraiture. At first, when I just saw the pictures and the description I thought he must be mistaken. Documentary connotes, classically speaking at least, of being in the moment, the decisive moment, being at the right place at the right time with the right equipment; on-the-hoof type imagery. It certainly doesn’t look like classic documentary. Portraiture on the other hand, yes; sitters aware of the camera, posing for the purpose of leaving a semi-delible image, still, composed, proof of their existence for generations to come. As is stands however, the description makes complete sense. A document of a recreation. ‘Re-enactments’ as they are aptly named. In treating the characters a little like types, stereotypes of their own making, and removing the background (picturesque hills and sky in rural England) the sparse image allows for the more subtle details to gain prominence. They come to life of their own accord without obvious elements like landscape and artillery to dwarf them. 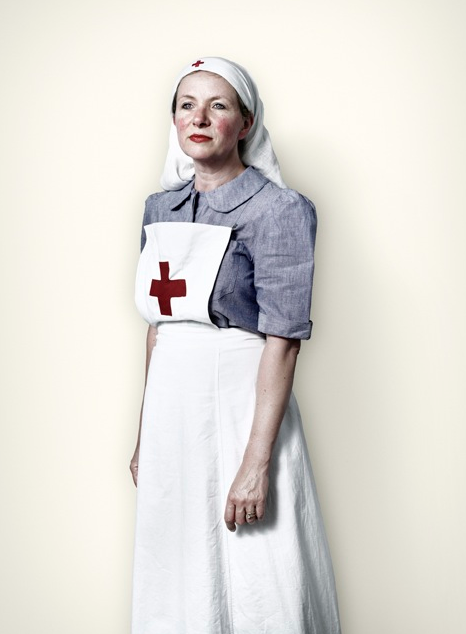 Looking at this image of the nurse raises multiple scenarios in my mind. First, as I instinctively go to her face, what is she thinking about and what is she looking at, over there, beyond where I can go? Her face looks ruddy, a hard working nurse (or perhaps a farmer’s wife.) The veins in her hands are prominent. She must have been using them usefully to help save the troops, or in making that new smoothie recipe she is perfecting for her grandchildren. Why didn’t she iron her apron properly with starch? She may have been in a rush this morning, needing to nip out for milk before getting there on time. You see the brain flickering between the two realities? Suddenly I’m confused about what is real. The image is telling me one thing I know it can’t be. I know the war is over and the fashion has changed (although didn’t I see that top in TOAST?) This woman cannot know first-hand what it is like to be a war nurse on that scale yet she is doing a pretty convincing job. Just as the actors, the image is also playing a convincing part. It is acting as a document of a reality that is acted. But still, a document it is, of that reality. SB: How did the project Re-enactors come about? JN: Having worked commercially for several years I was aching to shoot for myself again, and specifically to create physical prints for the wall or a gallery. It was partly a reaction to the escalating world of on line imagery, just the need to have something solid and printed. I was looking for a portrait project, and saw some snap shots of the Nazi re-enactors in a magazine. I knew I had my project. What interested you most when you first saw the event and all these people dressed up and performing? Having spent many of my childhood years building second world war tanks, soldiers and dioramas, it was quite thrilling to see everything in 1 : 1 scale, especially all the details, axels and gas mask canisters, for example. All the tiny fiddly bits that always got lost or drowned in glue! Then of course the Nazis were immediately quite scary as the uniforms still resonate a kind of terror, and as the Re-enactors are immersed in a fantasy world it was a strange, slightly unsettling experience approaching them. In the portraits there seems to be a ‘knowing’ that goes beyond that of playing a part. Something about their eyes. In taking individual portraits, separating them from their tribe, do you feel like you enabled them to really connect with what they were doing? What did you observe? I was very clear that I wasn’t making a documentary and therefore did not spend too long talking to the Re enactors about what they do or talking to them about what I was doing. I knew it was just going to be about the photographs, preferably with as little text as possible. I kept in contact with two of the Nazi Re-enactors who appreciated my efforts but thought the pictures would be better taken in a battlefield or a dilapidated house, so I’m not sure how much they liked them. There is a transformation that occurs when they are in uniform or in character which is strange to witness, but quite exhilarating to photograph, as its not simply someone looking extraordinary, they are also being extraordinary. I think I’ve tried to demonstrate this by isolating them, capturing them in a certain pose or state, and by adding a treatment in post production. The ‘knowing’ or that something in their eyes, may or may not be there, its an odd thing with photography but you tend to notice it later on in the editing. There may be ten images of the same person, but for some reason just one works and its hard to say why. I asked them to go back to the war, if they were not already, and at the very least this was in their heads – it looks like it in the picture but it may well be an illusion. There has to be some mystery in the work for me too – I can’t explain it all, thank goodness! In no. 2 from Battles I can’t help but think of Jeff Wall’s ‘Dead Troops Talk’. Is this something you intended and now that thy both exist how do you see your work in relation to this? I’m now looking at the Jeff Wall image along side mine and there are some striking similarities, but I think only visual, in all probability. In fact this is the first time I’ve read about the work and its called ‘Dead Troops Talk’ where soldiers come back to life and continue their conversations. There are actually two dead Re-enactors in my image who have come back to life and are having a good laugh together. I was only dimly aware of his image at the time but really just photographed what was in front of me. Although after that I have developed and constructed the images in a similar way to building my childhood dioramas, in a kind of instinctive and playful way. I think it echos the Re-enactors response in as much as its not real war, or anything to do with actual war, real blood or death, but just what looks ‘good’ to them. How did you transition from this series to your new work, Hereroes? I had travelled in Namibia after college, and actually photographed the Hereros back then. I was obsessed with the strange otherworldliness of the country, with its ghost towns, endless deserts, skeleton coast, wild west feel and its malleable, often brutal history. Its one of the least populated places on earth, and very little has been written about it. The Herero story is odd because it points to a particular point in history where they met the Germans (resulting in the Hereros Victorian era dresses) and eventually went to war with them (resulting in the Paramilitary costumes). There are some obvious connections to the two projects, but most of all its making connections with the past, or attempting to ‘explore’ history or someone’s idea of history, at least. Both armies are not ‘real’, and both operate in similar ways, rising through the ranks by how good you look and how much time you spend drilling or marching. I like the phrase you use ‘allowing the past to speak’. What role do you think photography plays in allowing the past to speak? That’s a hard question to answer. It does feel like I’m photographing the past, particularly with the Herero project as their clothing comes directly from this short period in history where the two cultures clashed. In that sense they ‘allow the past to speak.’ It feels like a portrait of that period, and I would include the Germans in that portrait. It’s still early days with this project (the book comes out next year with Merrell) and as with the Re enactors project a lot of questions are raised, and are sometimes answered or debated by viewers, reviewers or journalists. Sometimes questions remain unanswered, which is my preferred outcome. I am a photographer, after all.